Whew….I’ve had a hard week, and what better time to have a hard week than when Nathan is home to pick up my slack as I try to regain my composure after a stressful week thus the lack of activity on this blog. Apologies aside, I have many updates. Foremost on my mind is a beautiful call I got from Drew’s speech therapist this afternoon. After the initial flush of anxiety at the sight of the school calling, I was delighted to hear Ms. Kristin, Drew’s speech therapist, gush about Drew’s progress in school. Drew is using sentences now and making verbal requests instead of relying on gestures. Apparently, the kids were playing with rice and shovels and Drew excitedly announced to Ms. Kristin “Rice!” and “Shovel!” Drew requested his chair and directed Ms. Kristin where he wanted it placed. She mentioned how well he is interacting with the kids as school which is a HUGE relief! How exciting it must be to watch Drew. I think about all of those cute, amazing moments that go unrecorded and unmentioned. Such a travesty. After much prodding, I finally have a little light at the end of our tunnel of Drew’s walking future. I sent a fairly strong-toned email to the doctors office in desperate search for an answer. Although I realize that Drew is so unique and coming to a “clean-cut” solution is almost impossible, my “mama” part of me doesn’t want to sympathize with that. However, I did speak directly with Drew’s regular ortho doctor and we spoke, in length, about what he’s discussed with his colleagues, future outlook and options. It wasn’t surprising that the many doctor’s, who our doctor consulted with, initial concern was “robbing Peter to serve Paul” meaning correcting Drew’s legs so he can walk which would make it more difficult for Drew to compensate for his short arms by giving him an opposable appendage to provide support. Again, valid concern – it’s not that I insensitive to that aspect of Drew’s unique abilities. But, to be honest, sacrifice walking?!? I was encouraged to hear that if something were to be done, the next three to six months would be a reasonable timeframe. Encouraged and startled. Again, this is the closest we’ve come to doctors giving us any type of indication that surgery is possible and approaching so up until now, it seemed like a theory or something that was so far away it wasn’t worth worrying about. But now, now that the doctor is talking about cutting up my little baby and sawing through his bones and confining him to casts and bracing, it becomes all too real and scary. I have to remind myself about the long-term. The long-term will be worth it, but, oh, the short-term – and I thought my worry at work was going to give me stress-related heart disease! In speaking with the doctor, it was obvious that the outlook was pretty unpredictable right now. As I mentioned, the biggest challenge we face is balancing Drew’s ability to walk with allowing Drew all the tools necessary to function with his hands. Will he not be able to hold a cup? Will he be doomed to performing tasks with one hand as opposed to two “hands” – as he uses his left foot to brace things against his right knee as a “hand” so he can manipulate it with his right hand? This is the decision we have to face. And the ultimate concern: will the surgeries fail thus removing his current ability to use his legs in the fashion he does AND no ability to walk? Because, I have to admit: the rotation he has in his ankles, knees, and now I’ve heard, hips, is what allows him to bend the way he does. 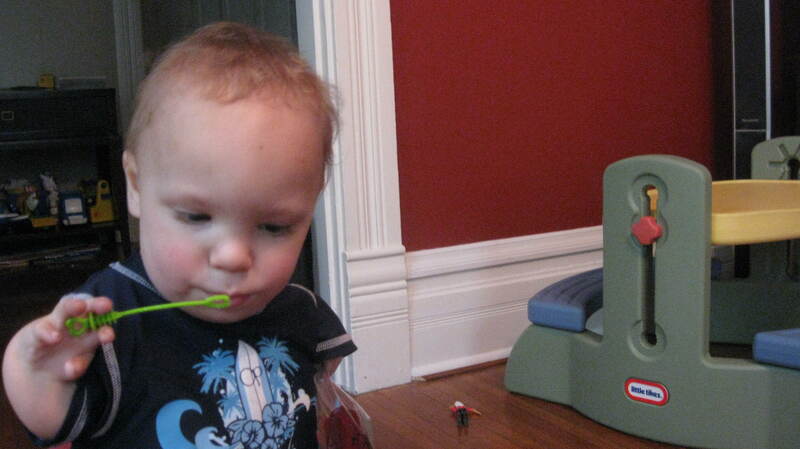 The mere thought is incomprehensible and as his parents, that responsibility lies on us. That’s the logical side of me. The “mama” side of me see’s inner strength that Drew demonstrates on a daily basis. It never ceases to amaze me how many people still approach me and comment about how happy Drew is. I know he’s only three and I can only hope he doesn’t realize he’s different yet, but I do have to admit that on some level he probably does realize he’s a little different. But does he question it? Does he linger on it? No, he strives harder to do the same things the other kids do. Drew could choose to be lazy and have me carry him to school or around the zoo, he could choose to not have to stomp through gravel and dirt only to arrive at the door out of breath and grunting. But he doesn’t. He chooses to put all of his energy and effort into doing it himself (booty scooting around on flat surfaces is not a problem, but it’s especially cumbersome for him to go up hills, through textured surfaces, etc.) That tells me that he has the drive, motivation, and desire to do whatever it takes to recover from reconstructive surgery and work towards our goal of walking and then some! I’m willing to bet that he’s going to be one of those patients that doctors underestimate and will turn into an amazing underdog. Deep inside, I’m a civil war of not wanting my baby in any pain and afraid of the risks involved in such a venture, but wanting to provide Drew every opportunity that I could possibly present him. In the end, as much as I hate to admit it, I don’t think it’s up to me. I don’t take sides usually, but I want to think that Drew is as determined and strong as he is for a reason. I like to think there was a design to his character. Doctors think he has legs to compensate for his arms, but I tend to believe that that is “small thinking.” I think he has an attitude that compensates for his syndrome and in this world, attitude is everything. Enough said about that. Nathan bought this amazing game for Drew, “Let’s Go Fishin'” which Drew has been completely obsessed with for the past few days. It’s a fishing game that requires him to hold a fishing pole above a spinning grid of fish gyrating around the board alternately opening and closing their mouths. Careful precision and concentration rewards you with a caught fish! It’s an AMAZING tool to enhance Drew’s hand-eye coordination and I would highly recommend it to any occupational therapist out there. Drew asks to “go fiiiishin!” every day! 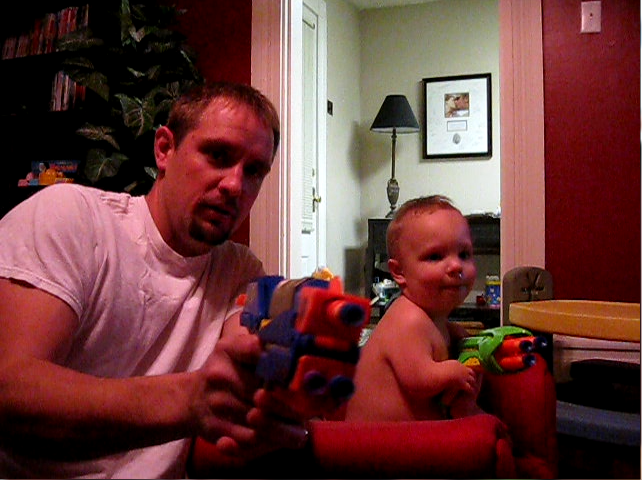 Tonight, Drew, Nathan and I played target practice at Drew’s direction to shoot either the dog, or one another. So funny! I’m not sure if I should be concerned about his delight in “shooting mama!” or “shooting daddy!” or chalk it up to normal toddler interests in toy guns. But none-the-less, we had a great time as a family, laughing and being active. Whether it’s playing “shooting games” or “go fiiiiishing!” we are doing something together that doesn’t involve the TV for more than half the night and that’s something I can be pround of. What’s more precious than bubbles? Next Post He’s a Star! Janel, I’m in awe of Drews progress, and you’re determination to do whatever it takes for him. 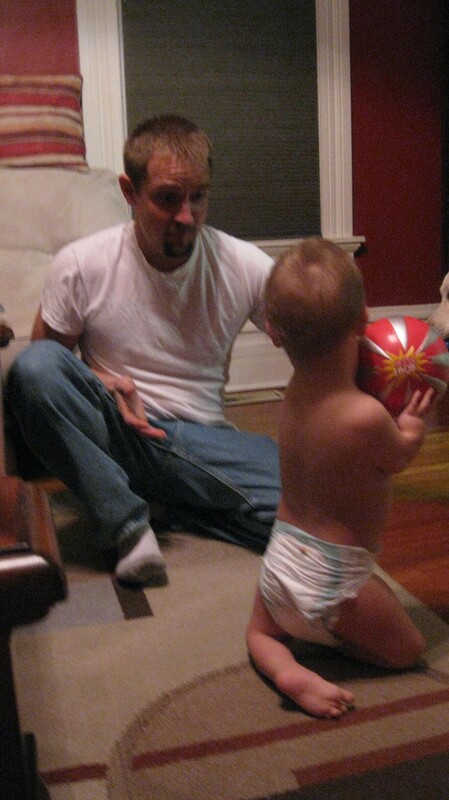 You and Nathan are exceptionally great parents. Y’all are thoroughly blessed. Janel, Drew sounds like he is full of determination and I completely agree with you on the fact that his attitude will get him through the leg surgeries and rehab. In the pics you posted it looks like he is holding a little ball, if he can do that he will be holding a cup in no time! If he wants to walk so badly it makes sense to try and let him. He will still find ways to use his legs for compensation if he needs to. He will find a way! Best of luck to your family in the coming months! Praying that things go smoothly!